Aluminium canister for 100 Veramon tablets (amidopyrine and barbitone) with contents remaining. 80 mm x 54 mm diameter, 77 g. Supplied by British Schering Ltd., English, 1920-1950. Glass bottle with plastic lid half-full of Orthoxicol cough syrup (codeine, methoxyphenamine). 102 mm x 40 mm diameter, 139 g. By Upjohn of England Ltd. of Crawley, Sussex, English, 1950-1975. Painted aluminium carton of 'Allenburys' Throat Pastilles (Terebene, Eucalyptus and Cocaine). 99 mm x 60 mm x 24 mm, 126 g. 54 pastilles in an elaborately decorated tin with blue and gold floral motifs. In original plastic covering. Front label of tin reads,'The Allenburys Throat Pastilles/ No. 69/ Terebene, Eucalyptus and Cocaine/ 54 pastilles, each containing/ Cocaine Hydrochloride gr. 1/60 Poison)/ Adult dose- One every two hours or as directed/ by the physician./ Manufactured by Allen & Hanburys Ltd./ London.' Manufactured by Allen and Hanburys, Ltd., London, 1920-1940. Small glass bottle with plastic lid containing sugar-coated Plexonal Hypnotic and Sedative tablets (dihydroergotamine, hyoscine, barbitone, phenobarbitone). 40 mm x 20 mm diameter, 7g. Supplied by Sandoz, from Savory and Moore, made in Switzerland, 1940-1970. Glass bottle with plastic lid of 'Orthoxicol' cough syrup ( methoxyphenamine, codeine, and sodium citrate), with traces remaining. 190 mm x 72 mm diameter, 388 g. By Upjohn of England Ltd., English, 1940-1970. 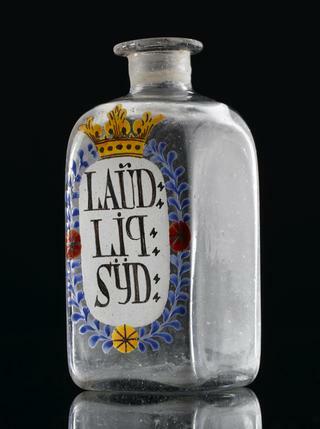 Glass bottle with cork stopper containing 100 gelatin-coated Sedative pills (sumbul, hyoscyamus, valerian, Indian cannabis). 98 mm x 35 mm x 22 mm, 74g. Made by Parke, Davis and Co., London, mid-twentieth century. Glass tube of 15 'Dialacetin' tablets (allobarbital and allylparacetaminophenol) in original carton. Overall: 20 mm x 21 mm x 77 mm, 18 g. Produced by Society of Chemical Industry in Basle, Swiss, 1930-1960. Glass bottle with plastic lid of 'Neurodyne' capsules (contain codeine phosphate), half-full. 116 mm x 58 mm diameter, 200g. Produced by Wade Pharmaceuticals Ltd., Scottish, 1950-1970. Canister of "Soneryl sodium" capsules (butobarbitone) with half of the contents remaining. Height 96 mm; diameter 47 mm, weight 49g. Inscribed '100 capsules each 0.15 Gm. 123/ TRADE MARK 'SONERYL SODIUM' BRAND/ Butobarbitone Soluable/ POISON/ .../ MAY & BAKER LTD./ DAGENHAM ENGLAND/ G X.247/ Distributors/ PHARMACEUTICAL SPECIALITIES/ (MAY & BAKER) LTD./ DAGENHAM ENGLAND'. Distributed by May and Baker Ltd., Dagenham, London. English, 1940-1960. 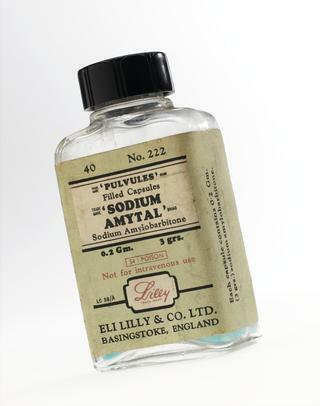 Painted aluminium carton of 'Allenburys' Throat Pastilles (Phenol and Cocaine). 99 mm x 60 mm x 24 mm, 126 g. 54 pastilles in an elaborately decorated tin with blue and gold floral motifs. In original plastic covering. Front label of tin reads,'The Allenburys Throat Pastilles/ No. 64/ Phenol and Cocaine/ 54 pastilles, each containing/ Cocaine Hydrochloride gr. 1/66 Poison)/ Adult dose- One every two hours or as directed/ by the physician./ Manufactured by Allen & Hanburys Ltd./ London.' Manufactured by Allen and Hanburys, Ltd., London, 1920-1940. Glass bottle with bakelite lid full of blue 'Sodium Amtyal' filled capsules (amylobarbitone). 81 mm x 44 mm x 25 mm, 68 g. Produced by Eli Lilly and Co., Ltd., English, 1960-1975. 1 carton of ampoules (unknown quantity, possibly 10) containing cocaine hydrochloride. Wrapped in paper and sealed with a wax seal of the distributor. Inscribed with the contents and have a stamp bearing the legend 'Woolwich Army Medical Store 5th 1921' and possibly '7 Field Medical Base(?) also sepearate label reading. Possibly a broken ampoule due to staining around box. 'Cocaine is the oldest local anaesthetic but because of systemic toxic effects and the danger of causing addiction its is now almost entirely restricted to opthalmic surgery and surgery of the ear nose and throat' (Martindale, 25th ed 1967). 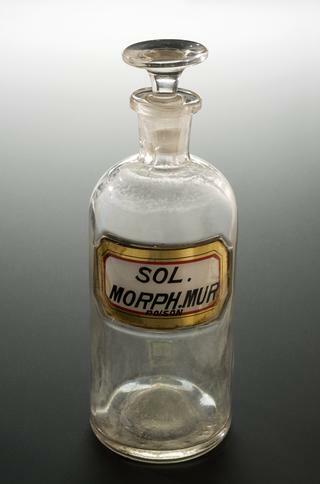 Small clear glass bottle with cut-glass stopper. leather cap and paper label. Containing a 10% solution of cocaine hydrochloride. Bottle contains some contents. Circular metal canister of pink 'Protamyl' tablets (promethazine and amylobarbitone). 45 mm x 25 mm diameter, 10 g. Produced by May and Baker, from Savory and Moore, English, 1940-1970. Clear glass bottle with glass stopper and paper label to contain approximately 8 ounces of solution of coca (liquor coca). Some contents remain. Dispensed by Savory and Moore Ltd, London. Clear glass, circle based bottle with cut glass stopper and transfer printed label. Containing unknown quantity of octagonal-shaped codein lozenges (Trochisci codeinae). Label inscribed with 'TR. CODEIN'. Each lozenge is impressed with the legend CODEIN'. 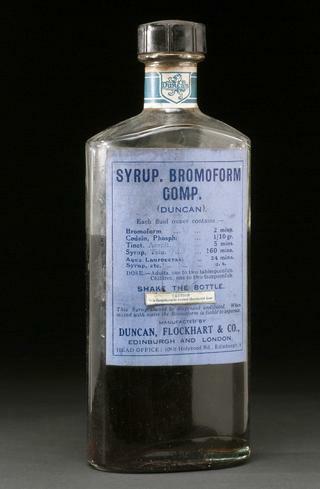 Perhaps an indication of manufacturing chemist 'Savory and Moore'?. Spray for cocaine with resevoir, cork stopper and metal spray tube. Resevoir: 60 mm x 10 mm, 24 g. Unknown maker, German, 1910-1920. Tin-glazed earthenware drug jar, polychrome decoration for extract of poppy ( ESTRATTO DI PAPVERO). 127 mm x 143 mm diameter, 750 g. Decoration depicts a monk gesturing to the Christogram, bordered by floral motifs. Unknown maker, Italian, possibly Castelli, 1590-1800. Glass bottle with cork stopper in original plastic wrapping of 100 No. 489 compressed Mentholated Throat tablets (menthol, benzoic acid, cocaine, anise). 136 mm x 50 mm x 31 mm, 194g. Made by Parke,Davis and Co., English, early twentieth century. 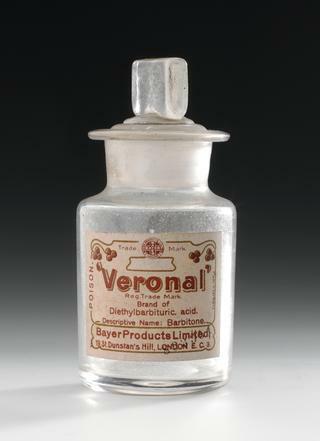 Pear-shaped amber glass bottle with metal lid containing 100 Acytosal Compound Sedative 'pulverettes' (acytosal, phenacetin, caffein, codeine). 79 mm x 59 mm x 47 mm, 165g. Made by Oppenheimer, Son & Co. Ltd., England, mid-twentieth century. Brown glass, rectangle based small bottle with plastic pop cap and paper label. To contain 100 tablets of codeine phosphate. Codeine is an analgesic manufactured from the methylation of morphine. It is much less toxic than morphine and even large do not produce the central depression characteristic of morphine. Doses larger than 60 mg rarely produce any greater analgesic effect than lower doses. Clear glass, circle based bottle with cork stopper and paper label. Paper label around bottle. To contain approximately 4 ounces of concentrated decoction of opium seed (decocto papaveris concentratum). Four glass tubes of "Tetronox" tablets (barbitone), within original cartons, complete with contents. 19 mm x 61 mm x 19 mm, 48g. Inscribed: 'SAVORY & MOORE / TETRONOX/ TRADE MARK BRAND/ TABLETS/ 10 TABLETS/ EACH 9 GRAINS/.../ Barbitone B.P. 80.7% Phenazone 5.5%/ Phenacetin 5.5% Hexamine 1.1%/ Magnesium Peroxide 0.9% Excipient to 100%/POISON' Made by Savory and Moore Ltd., London. English, 1940-1960. 4 x glass tubes in cartons of Tetronox tablets. Small physician's sample carton of 100 'Allonal' tablets (allobarbital). 46 mm x 34 mm x 6 mm, 6 g. Manufactured by Hoffmann-La Roche Chemical Works Ltd., 7 and 8 Idol Lane, London, EC3, England, 1930-1960. Amber glass bottle of 100 gelatin-coated sedative pills with cork stopper. 100 mm x 35 mm x 23 mm, 66g. Label reads, '.../No. 593/SEDATIVE/Ext. Sumbul/.../ Ext. Hyoscymus.../Ext. Valerian.../Ext. Indian Cannabis.../Dose: 1 to 2 pills/.../PARKE, DAVIS & Co./LONDON'. Cork stopper is glazedin an adhesive and bears a logo with the name 'Medicamenta Vera'. Produced by by Parke, Davis and Co., London, 1910-1940. Green glass poison bottle with bakelite lid, containing powdered traces of barbitone sodium. 99 mm x 55 mm diameter, 141 g. Made by Savory and Moore Ltd., Standard Works, Lawrence Road, Tottenham, London, N15, England, 1930-1960. Green glass poison bottle with bakelite lid containing 1 gr. Amylobarbitone tablets. 79 mm x 45 mm diameter, 122 g. Produced by Wright, Layman and Umney, Ltd., English, 1920-1960. One packet of 28 press out pills, for the prototype male contraceptive pill, probably desogestrel. 125 mm x 70 mm, 6g. One pill to be taken daily, in combination with a monthly injection of testosterone. Manufactured by Organon, Netherlands, 2000. Small, clear glass, square based bottle with glass stopper and metal clip and transfer printed label. To contain approximately 2 ounces (54.2 grams) of cocaine hydrochloride. Some contents remain. Glass, square based bottle with glass stopper and paper label. Label reads 'Cocaine Mist 8%'. Believed to be Cocaine hydrochloride. There are no contents but a trace remains. Dispensed by C R Sharman APS, of Gravesend, Kent. Clear glass bottle with glass stopper and transfer label, to contain approximately 2 ounces of cocaine hydrochloride. Some contents remain. Believed to be German in origin. Glass bottle with bakelite top of 250, gr. 3 amylobarbitone sodium pills. 117 mm x 58 mm diameter, 307 g. Supplied by Savory and Moore Ltd., Standard Works, Lawrence Road, Tottenham, London, N15, England, 1940-1970.